Jules Janssen was permanently lamed by an accident in early childhood. He studied at the University of Paris, and in 1865 became professor of general science in the school of architecture. He was an enthusiastic observer of eclipses. In 1870, when Paris was besieged during the Franco-Prussian War, he fled the surrounded city in a balloon so that he could reach the path of totality of a solar eclipse in Africa. With his photographic revolver, Janssen travelled to Japan to record and observe the transit of the planet Venus across the face of the sun, on 8 December 1874. The photograph most needed by astronomers was that showing the precise moment when the outline of the planet first encroached on the sun's disc. As that moment was unpredictable, a clockwork 'revolver' was devised to take a sequence, one of which would be the required image. The revolver took forty-eight exposures in seventy-two seconds on a daguerreotype disc; a process was no longer in general use, but ideal for the project - the metal plate ensuring an absence of halation (flare) that could have been a problem if a glass plate had been used - and a wet plate would in any case have been inconvenient to use in such a camera. With the sun as the source there was no shortage of light, so the 'slow' daguerreotype process was ideal. The images were of good quality. Two English expeditions also used apparatus as suggested by Janssen to record the transit of Venus. Janssen presented the photographic revolver to the Société Francaise de Photographie in 1875, and to the Académie des Sciences in April 1876, where he suggested that his apparatus might be used for the study of animal movements, especially those of birds, when materials sensitive enough to permit the very brief exposures necessary became available. Janssen's experiments influenced E-J. Marey's later chronophotographic work, and his camera used a modified version of the Maltese cross-type mechanism that would later be of such importance in cinematograph engineering design. For three years 1891-93, and three years 1900-1902, he was President of La Société Française de Photographie; a position also held by Marey and Louis Lumière. 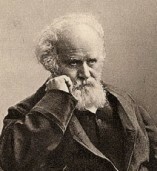 Janssen appeared in two very early Lumière films, Débarquement du Congres de Photographie a Lyon - where he is easily distinguishable by his particularly bushy white beard - and M. Janssen causant avec M. Lagrange, filmed on 11 June 1895 and shown to the Congress the next day. For the latter film, Janssen and Lagrange were secreted behind the screen and spoke the dialogue of their conversation as the film was projected. In 1904 he published his great Atlas des photographies solaires, containing more than 6000 solar pictures. He died on December 23 1907 at Meudon, France, where he had been director of the Observatory. A crater on the moon is named after him.